Home Gadgets News KINGMAX releases SATA 6Gb/s interface mSATA MMP30 SSD! KINGMAX releases SATA 6Gb/s interface mSATA MMP30 SSD! The world-renowned memory and FLASH module manufacturer KINGMAX has pinpointed the trend of increasing demand for miniaturized solid state drives. With the recent release of the MMP20 mSATA SSD, now the mSATA MMP30 SSD that uses the SATA III 6Gb/s interface is also released. Not only is it suitable for the newest Ultrabook, it is also suitable for tablet PCs and Small Form Factor or embedded systems. The MMP30 has both performance and economic benefits, making it the ideal choice for system integrators or manufacturers. Average consumers can also use the MMP30 SSD with a mainboard that supports Intel Smart Response Technology to easily upgrade the system performance. The KINGMAX mSATA MMP30 SSD uses the SATA III 6Gb/s interface, and complies with the newest generation Ultrabook specifications defined by Intel. It is equipped with the high performance LSI Sanforce controller, and the MMP30’s maximum sequential write speed can reach as high as 520MB/s with a maximum sequential read speed as high as 320MB/s. Capacities come in 32GB, 64GB and 128GB. 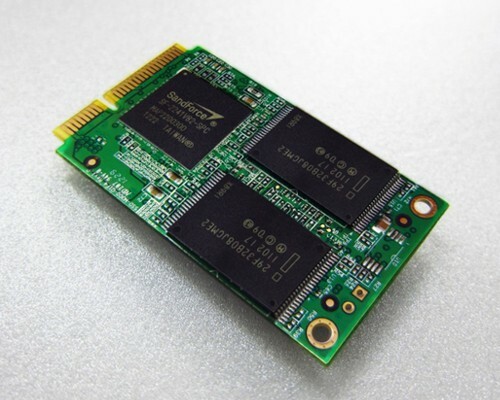 With the diverse development of the Ultrabook, the mSATA MMP30 SSD provides system integrators or manufacturers another excellent selection that is both economical and that includes high performance. In addition, the MMP30 solid state drive has lightweight and compact features, and complies with JEDEC MO-300B specifications, which makes it suitable to apply in Small Form Factor or embedded systems and also the currently popular tablet PCs. It can increase their overall data read and write speed, speed up startup time and program application operation time, and reduces power consumption. For computer gamers, the KINGMAX mSATA MMP30 SSD is the most economical storage device for performance upgrade. Once the mainboard supports mSATA and the Intel Smart Response Technology (SRT), the mSATA SSD can be configured through SRT to set the cache memory between the hard drive and the system memory. Computer gamers no longer need to spend much money purchasing large capacity solid-state drives. Just install the MMP30 mSATA SSD with ordinary hard drives to allow the system to keep the super large capacities of traditional hard drives, and have the performance advantages of solid-state drives. It is undoubtedly a smart and economical system upgrade. The KINGMAX MMP30 SSD complies with EU RoHS specifications (Restriction of Hazardous Directive; related specifications on the restriction on the use of hazardous substances in electronic and electrical equipment), and has passed the EU’s CE, the U.S.’s FCC, and the Bureau of Standards, Metrology & Inspection, M.O.E.A., the R.O.C’s BSMI certification. In addition, KINGMAX’s SSD have rigorous quality control and production specifications; all the products have passed 100% rigorous tests to ensure the highest quality of the products. They also come with a 3-year warranty service, providing consumers with a guarantee of safe usage. Smart Bro UnliSURF 85: Unlimited internet for 2 days is now made affordable! Cherry Mobile Flare new software update now available to download! Sun Cellular intensifies 3G network coverage nationwide! Alcatel ONE TOUCH 997D Explore and 993D Insight PRICE DROP! Ilonggo Tech Blog is a local tech blog in the Philippines. This blog is a compilation of the different tech news and reviews for the benefit of the Ilonggos and for everyone who are technology savy.